The generated FE mesh can be evaluated by using the Mesh Quality Criteria. 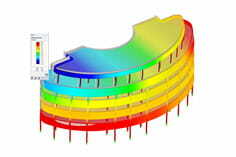 The quality of the FE mesh can be displayed graphically using the Display navigator. It is also possible to display the “OK”, “Warning” and “Failed” Elements separately for surfaces and solids. Furthermore, you can also graphically display the Mesh Quality Annotations.